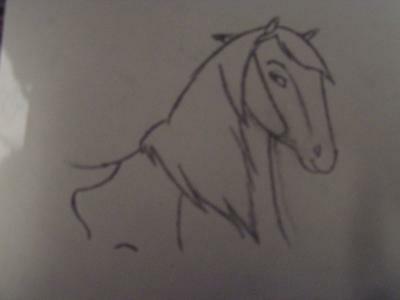 This is my drawing of the pinto mare off of Spirit: Stallion of the Cimmaron (I love that movie)! I really had fun drawing it. Oh my gosh you are soo talented! This is amazing! Best drawing of Rain I have ever seen. I love the movie! Amazing Job!!!!!!!!!!!!!!!! I love that movie too. I drew a lot of pictures from that movie! that is sooooo good it looks exactly like the actual horse in the movie spirit. I would never be able to draw that good. you're going to be an artist someday!!!!!!!!!!!!! you did a really good job. I'm going to put some of my drawings on here and I was drawing pictures from spirit stallion of the cimmaron! omg it looks just like the movie!!! you did an awesome job. cool mare it is so pretty. That Drawing is just sooooo beautiful! I have watched Spirit, stallion of the cimmaron, and it looks like the rin off the movie! Keep up the good work! wow that looks like rain off of spirit. you have a talent oh and sorry about the name i like to keep my name secret. Your drawing is the bomb! I can draw Spirit too, but yours looks exactly like Rain! I think there is going to be a Spirit 2, they just have to make it, if you google Spirit2 there is a website that tells you what the story plot is. i love that movie too. your drawing is good and i'm very picky about horse drawings so yeah hope u draw spirit next thanks. OMG, OMG OMG OMG OMG i LOVE this so badly! i mean it is the best one I have ever seen in my whole entire life. woah that is really good!!!!!!!!!!! It looks just like Rain!!!! ps: does anyone know if there is going to be a 2nd Spirit? Aww, I love Rain, she is my fave character next to Spirit himself. This is a great drawing and I love it! That is excellent! I love it! i love horses and i love this horse drawing. i am a good drawer myself but i'm in third grade. i draw best for 3rd grade and i have a unicorn, fantasy horses like rainbow colors, and horses collection. my favorite one is rainbow dash in fantasy horses bye bye. WOW, Nice! I love Spirit too, You Draw GREAT.